For the past three summers, archaeologists have dug up the grounds of a William & Mary dorm in search of the “smoking lunchbox”—the archaeologists’ term for a material-culture connection between the 18th-century Bray School and a building still in use on the William & Mary campus. Meyers, Chancellor Professor of English at William & Mary, traced the location of the Bray School to a lot at the corner of North Boundary and Prince George streets. He further has proposed that the building that hosted the school still stands on the William & Mary campus; it’s now known as Prince George House and houses William & Mary’s ROTC program. It’s a thesis that carries significant historical and cultural implications, as the Bray School was an early institution in the Americas dedicated to the religious education of free and enslaved black children. Affiliated with William and Mary on the advice of Benjamin Franklin, the Bray School opened in 1760 and operated for five years at the site before moving to an unknown location, probably near Capitol Landing Road, Meyers said. Meyers is the co-chair of William & Mary’s Lemon Project, in part a multi-disciplinary investigation of the College’s relationship with enslaved people. He said that archaeological affirmation that the Bray School’s physical structure is still standing would create a tangible link to a historical institution of American history that otherwise survives in old documents and in an oral tradition among descendants of Bray School alumni. Meyers added that if the Bray-Digges connection can be verified, he’d like to see the building developed into a historical exhibit. Archaeology hasn’t been able to confirm Meyers’ Bray-Digges connection—but neither has it been able to produce compelling evidence for an alternate theory, proposing that the Bray School was held in a different building, long destroyed, on the same site. Mark Kostro is an archaeologist with the Colonial Williamsburg Foundation and a Ph.D. student in William & Mary’s Department of Anthropology. He has led field schools at Brown Hall for the past three summers, along with Neil Norman, assistant professor of anthropology at the university. The two archaeologists accept Meyers’ thesis that the Bray School was conducted at the Brown Hall site, but are skeptical of the connection with the existing building, formerly known as the Dudley Digges House. The Digges House, much expanded and modified, was moved down Prince George Street in 1930. Meyers counters that the dating of the Digges/Prince George house has yet to be confirmed through examination of paint samples and dendrochonology. He also cites a paper trail tracing the development of the lot to as early as 1717. In the meantime, Kostro offers the second-building thesis, a hypothesis that Meyers’ paper trail leads to a different house. Kostro’s thesis suggests that the Bray School operated in an earlier house, one that was razed and replaced by the structure that became the Digges/Prince George building. As the 2013 field school ended, the student archaeologists had uncovered a portion of 18th-century foundations that Kostro suggested might be a candidate for the original Bray School building, in accord with the second-building thesis. In June of this year, the first field school concentrated on the foundation, excavating enough of the feature to reveal that the structure was too small to be a dwelling. The final field school began in July, with both the Bray-Digges and the second building theories in play. The archaeologists are focusing on an area that is closer to the precise spot where both Meyers and Kostro believe the Digges House once stood. Brown Hall, built in 1930, probably sits solidly atop much of the footprint of the Digges House and anything that may have preceded it. The work is concentrated right up against the foundation of the dormitory, which will again hold William & Mary students next month. Brown Hall is not scheduled for replacement or demolition, but Meyers hopes that the eventual replacement of the residence hall will open up the area underneath for additional examination. The field schools have already found a number of artifacts that have implications for 18th-century education. Kostro says some 40 fragments of slate pencils have been excavated, well in excess of the number excavated on a single site in Williamsburg. Other interesting artifacts have come to light, representing the full range of the site’s three centuries of occupancy and nearly 80 years as a college residence. 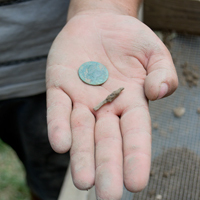 The field schools have excavated a variety of eighteenth and nineteenth century bottles, plates and mugs, including a nearly intact 19th-century teacup, jewelry, tobacco pipes, keys, auto parts, and 18th-century coins. A handful of needles, buttons and other sewing items, relics potentially representative of the domestic aspects of the Bray School curriculum, have been also been recovered, but not in the same unusual quantity as the slate pencil fragments. Once this summer’s archaeological possibilities are exhausted, the next test of the Digges-Bray thesis will likely come from scientific examination of the oldest fabric of Prince George House, which could range from as early as 1717 to as late as 1770. As work continues, Meyers is willing to make it even more interesting.